What are all these strange things? How are they related? Why are they here? 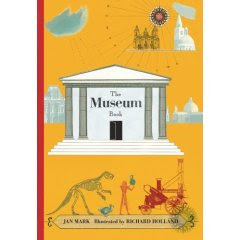 Marks explains the history of museums in a series of short chapters and aong the way, she talks about the Greek muses, the evolution of human knowledge, medieval Christianity, Russian history, architecture, and current controversies in the the ownership of antiquities. This book is very like the museum of the opening piece - a collection of fascinating pieces packed together in one place. The illustrations follow this pattern, including both print and collage, sometimes humorous, sometimes technical. One could quibble with the ending paean to memory, "But there is another kind of collection that everyone has, including you. It is in your head. Everything you have ever seen, heard, smelled, tasted, or touched is in there....You can get it out and have an exhibition whenever you want". If you've ever lost your keys or had a pop quiz, you know memory is not so simple! However, it's a fascinating look at museums, history, knowledge, and the way humans think. Verdict: An interesting and unusual book, this will need some special booktalking - and specific children and parents - to find an audience. An additional purchase. Here I am, starting a blog. I am rapidly moving up the ladder of technology - only a few weeks ago I downloaded music and started using Chat. Update: October 22, 2011. I think I kinda know what I'm doing now, so, being an obsessive person, I'll be going back and cleaning out and reformatting all my posts for the past three years. Fun! I will be working on filling in and reorganizing the past three years according to my new settled posting schedule, relabeling posts, updating sources and book information, and will delete a lot of old stuff as well. I hope this will make the site more useful to librarians and readers!